Pacific Cataract and Laser Institute optometrists Aaron Bronner, OD, (Kennewick, Wash.) and Ami Halvorson, OD, (Portland, Ore.) discuss comanagement of cataract, refractive, glaucoma and corneal surgical cases, including surgical concepts and postoperative complications. The authors report no financial disclosures. Our last blog looked primarily at macular sources of reduced acuity that are frequently seen in a cataract patient and occur much more frequently than subtle corneal vision loss. For this third and final part of our series on other sources of vision loss that present along with a cataract, we’ll look at conditions that can be made worse by cataract surgery. Lid margin disease in an older population is quite common and is often considered more of a nuisance than a severe pathology, but in the setting of cataract surgery, the importance of untreated blepharitis skyrockets. Characterized by significant crusting and erythema of the lid margins, bacterial-associated blepharitis is a significant risk factor for the development of our least favorite, postoperative infectious endophthalmitis. This risk is also carried over with nasolacrimal infections and hordeolum. Because of this, it’s critical that blepharitis (and other forms of microbial lid margin disease) are cleared prior to cataract surgery. We’ve both had the unfortunate job of canceling patients who traveled hours for evaluation and planned surgery to follow, often having to pull an adult child out of work to serve as transportation, because of significant untreated blepharitis. Because the potential consequence is so severe, there is no wiggle room for these eyes. The lids have to be treated prior to considering surgery. FECD is the No. 1 indication for corneal transplant in the U.S. and is something ODs are all familiar with as a source of reduced vision. The condition is important in the setting of cataract surgery for two reasons. First, FECD can cause reduced vision well before the onset of clinically apparent corneal edema, and this vision loss cannot be distilled out from the cataract-induced vision loss (gas permeable lens spherocylinder overrefraction won’t be helpful, and super-pinhole retinal acuity won’t be helpful). Second, cataract surgery causes a progression of the condition, as phacoemulsification results in both oxidative and thermal stress to the corneal endothelium, which causes endothelial cell loss. This effect is relative to the duration and amount of phacoemulsification used and can be minimized through the use of both viscoadhesives and viscodispersives at the time of surgery but cannot be eliminated completely. This patient’s cornea, seen with retro illumination, highlights the dramatic irregularity in optics caused by their 3+ to 4+ guttata. In this case, despite not having any clinical edema, evaluation for combined procedure or, at minimum, educating about the potential for future transplant would be appropriate. Source: Aaron Bronner, OD. Because of the potential for cataract surgery to worsen their corneal disease, any patient with significant FECD (3+ to 4+ guttata, with or without clinical edema) should be evaluated for a possible combined or sequential cataract/endothelial transplant. If a sequential surgery is decided on (that is, the transplant will follow the cataract operation as needed), don’t be surprised if the surgery center alters the refractive target in an unusual way. Because these transplants have the tendency to induced hyperopia, the refractive target of the cataract surgery will be influenced by the specific transplant being performed. For Descemet’s stripping automated endothelial keratoplasty a target of -1.00 D to -2.00 D is usually set, and for Descemet’s membrane endothelial keratoplasty a target of plano to -0.50 D is set, with an ultimate goal of an emmetropic outcome after both the cataract and transplant are complete. Cataract development is among the most frequently encountered sequela of uveitis, and depending on specific etiology of uveitis, subsequent cataract incidence may approach 100%. It’s easy to see that the mechanical disruption of the blood aqueous barrier, such that occurs with cataract surgery, can have a significant negative impact on any active uveitis. Therefore, it’s easy to understand that uveitis episodes need to be quieted prior to surgery, but, unfortunately, it’s even more complicated than that. Due to potential for exacerbating uveitis and worsening outcomes, the national standard of practice for cataract surgery in uveitis patients is to have their inflammation totally quiet off steroid for between 2 and 3 months without relapse of the disease prior to undertaking cataract surgery. Further, it’s important to educate uveitis patients about their increased risk for both intraoperative and postoperative complications, including recurrence of their inflammation. Although it’s not considered a treatment of most glaucomas (phacomorphic angle closure being the exception), cataract surgery offers some benefit in the treatment of glaucoma patients. With or without minimally invasive glaucoma surgery, the long-term impact of cataract surgery on IOP is, on average, a lowering effect. That said, patients with severe and end-stage glaucoma can experience worsening of their disease from IOP spikes characteristic of the early postoperative period. It’s important to recognize that a high percentage of cataract patients have an IOP spike at the day 1 postop, and about 10% will spike over 30 mm Hg, although these will generally return to normal levels within the first week. This short spike of IOP may be tolerable for patients with normal optic nerve health, however, those with very tenuous nerves need special precautions to reduce the risk of developing these spikes. Surgeons can be diligent about irrigating out surgical viscoelastic (which is a primary factor involved in the risk of early pressure spikes) at the conclusion of surgery, and pre- and postoperative oral acetazolamide may be used to dampen the spikes to a large degree, but even with these precautions, IOP may go up. Frankly, it’s our opinion that patients with glaucoma this severe should be seen by a glaucoma specialist prior to any surgical decision-making. Beyond spikes seen in the very early postoperative period, later IOP spikes tied to corticosteroid use occur more frequently in glaucoma patients. These are easily managed in patients who are not being treated for glaucoma; however, in a patient already on maximum medical therapy, treatment options can be more complicated and involve transitioning to loteprednol or, in cases where even this fails, transitioning totally to NSAID to control inflammation. To understand the differences in risks in this pathologic spectrum, it’s probably a good idea to briefly review the differences among this group. Vitreomacular adhesion occurs with an adherent vitreomacular face but without distortion of retinal architecture (on OCT). In patients with recently diagnosed minimal vitreomacular adhesion, cataract surgery is probably fine. These eyes are generally symptom-free and don’t usually go on to develop any worse pathology. Vitreomacular adhesion. Vitreomacular interface is not intact, but there is no distortion of the fovea. This patient is suitable for cataract surgery. Vitreomacular traction, on the other hand, is part of the spectrum of macular holes (either stage 1 or 2). The effect of cataract surgery on these eyes is somewhat unpredictable. 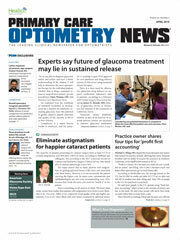 In eyes with recently diagnosed significant traction, retinal clearance should be sought. In eyes where vitreoretinal separation has already occurred with subsequent lamellar full thickness macular holes, cataract surgery is safe, but the patient should be educated on their reduced visual potential. Given the influence of tractional forces on risk for development of cystoid macular edema, we will add topical NSAIDs in eyes where vitreomacular traction persists. Vitreomacular traction. This patient, with obvious tractional distortion of the fovea, needs to visit the retina doctor prior to surgery. The risk of retinal detachment goes up at least fourfold with cataract surgery and to this day remains the primary controllable risk factor for detachment within a person’s life. While this risk is greatest over the first 6 months postoperatively, it remains elevated for years beyond surgery. The risk goes up further with factors such as axial myopia or surgical complications. Because of this, having any peripheral retinal pathology that may go on to detach evaluated for treatment by a retinal specialist prior to cataract surgery is appropriate. This would include retinal breaks, new holes with surrounding fluid cuffs, newly diagnosed retinoschises and extensive retinal lattice in patients who have had retinal detachment in the fellow eye. In the setting of a recent onset symptomatic posterior vitreous detachment (PVD) occurring simultaneously with impending cataract surgery, we usually like to have the patient rechecked in a month, as you would generally do with a PVD. After this time, assuming no worsening of symptoms or change in signs, cataract surgery can usually proceed. As an aside, hypervigilance to the risk of retinal detachment in these eyes postoperatively may lead to excess concern with patient reports of flashing lights. As a profession, we attribute these subjectively reported flashes most frequently to tractional retinal photopsias, but when they immediately follow cataract surgery, in most cases you are dealing with reflective dysphotopsias. Postoperative photopsias can generally be differentiated by classifying the environment they occur in: Those that occur in a totally dark environment (as when going to bed) are most typically retinal in origin and should be worked up with dilation; those that develop in the early postoperative periods and occur only in a lighted environment, with a direction orientation of the ambient light (lights coming from an angle rather than diffuse light, like daylight) are usually reflective dysphotopsias. To be frank with the readers, part of our job at cataract referral centers is to identify all coexisting ocular pathology in patients considering cataract surgery in order to give patients realistic prognoses about their anticipated outcomes, to halt surgery for patients with pathology that may be worsened with cataract surgery or that which may worsen the outcome of the surgery. When these pathologies have not been previously discussed by referring doctors it can be jarring and upsetting to the patient to hear it from the surgery center. No matter how delicately it is worded, no one likes to be surprised at a surgical consult. Comanagement works best when patients hear the same thing from their referring OD that they hear from their surgery center. With this in mind, make sure the eye has been primed as needed to ensure the cataract surgery does not worsen any underlying pathology.